While China's H7N9 activity has dropped off a cliff in the year since they launched a nationwide H5+H7 poultry vaccination program, over the past few months we've seen a significant uptick in both human infections and poultry outbreaks with the HPAI H5N6 virus. Earlier this week we looked at a pair of poultry outbreaks - roughly 400 km apart - in Yunnan Province, and three weeks ago we looked at the 4th H5N6 human infection of the year; a Fatal H5N6 Case In Guangxi Province. Today we have word from Hong Kong's CHP, the Jiangsu Ministry of Health, and China's MOA of a Jiangsu Province's first reported human infection (China's 23rd since 2014, and 5th of 2018), plus a report of a poultry outbreak roughly 100 miles away from the human case. Of note, this human case - that of a 10 y.o. child - is reported from the Suzhou District, Suzhou City; approximately 50 miles from Shanghai. The Centre for Health Protection (CHP) of the Department of Health (DH) today (November 23) received notification of an additional human case of avian influenza A(H5N6) in Jiangsu from the National Health Commission, and again urged the public to maintain strict personal, food and environmental hygiene both locally and during travel. The case involved a 10-year-old girl from Suzhou in Jiangsu. She developed symptoms on October 29 and was hospitalised on November 3. She is now in a serious condition. From 2014 to date, 23 human cases of avian influenza A(H5N6) have been reported by the Mainland health authorities. Travellers to the Mainland or other affected areas must avoid visiting wet markets, live poultry markets or farms. They should be alert to the presence of backyard poultry when visiting relatives and friends. They should also avoid purchasing live or freshly slaughtered poultry, and avoid touching poultry/birds or their droppings. They should strictly observe personal and hand hygiene when visiting any place with live poultry. This is the 4th human H5N6 infection to be reported by China in as many months. Given the limits of surveillance and reporting, it is not impossible that additional cases have occurred but have not been reported. November 20th, 2018, Jiangsu Province confirmed one case of H5N6 cases. The patient was 10 years old girl, now living in Suzhou District, Suzhou City, is currently treated in isolation in hospital in a critical condition. After the outbreak, I appointed quickly organize epidemiological and clinical therapist, and actively carry out epidemiological investigation, isolation and treatment of cases, close contact tracing management (three close contacts had no physical discomfort, throat swab test results were negative), risk assessment work, strengthen epidemic active surveillance, guidance and organization of medical experts to Suzhou patient treatment, strengthening prevention and control knowledge publicity, effectively prevent the epidemic from spreading. Provincial prevention and control experts believe: H5N6 virus into a highly pathogenic subtype of influenza virus, the virus of avian origin. Sichuan Province in 2014 the first reported cases. The cases of human infection with H5N6 found belong to sporadic cases, low-risk person to person. Experts advise: the public in their daily lives should avoid contact with sick or dead poultry, try to avoid direct contact with live birds; not to buy live poultry without quarantine certificates from the flow of live birds at street vendors and bred; there is history of exposure to poultry and fever and respiratory symptoms appear, You should wear masks, as soon as possible to local medical institutions for treatment, and the initiative to inform poultry exposure history to the doctor. Meanwhile, overnight China's Ministry of Agriculture is reporting an outbreak of H5N6 in poultry in the Jiangdu District, Yangzhou City, Jiangsu province - located roughly 100 miles to the North and East of Suzhou City. It is unknown whether the human case and the poultry outbreak are epidemiologically linked. Ministry of Agriculture and Rural Press Office 11 Yue 23 released, Jiangdu District, Yangzhou City, Jiangsu province poultry with H5N6 subtype highly pathogenic bird flu. 11 Yue 22 Ri , the Ministry of agriculture and rural areas to the control center reported Chinese animal epidemic prevention, the national bird flu reference laboratory confirmed, Jiangdu District, Yangzhou City, Jiangsu Province, a poultry farm occurred H5N6 subtype highly pathogenic bird flu, poultry breeding stock 11810 birds, the incidence of 1200 Yu, died 320 birds. After the outbreak, according to the relevant local prevention plans and technical specifications, adhere to the prevention and control law, science and prevention and control, really good job in the disposal of the epidemic, poultry have been culled 31,329 birds, all dead and culled birds have been safe disposal. 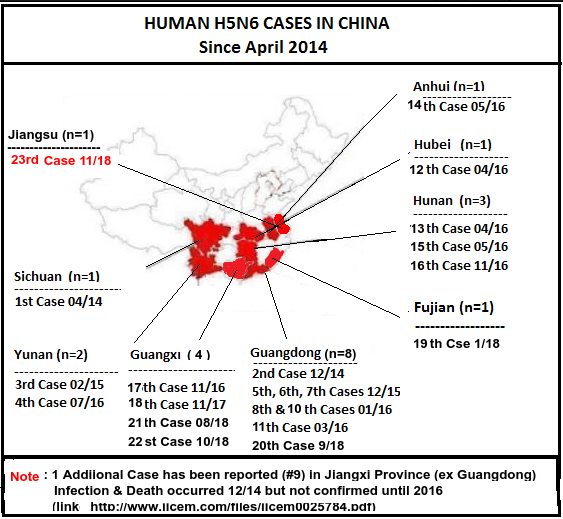 While HPAI H5N6 hasn't shown the ability to spread easily between humans, its high fatality rate among known cases, and its genetic similarity to HPAI H5N1 (and H5N8) are concerning. While the year-long respite from H7N9 activity in China has been most welcome, there's an impressive array of other viral contenders (H5N6, H9N2, H7N4, H10N8, etc.) circulating in China - and H7N9 may not remain quiescent forever.